SUITE INFANTIL (1998): A CHAIN OF LITTLE NUMBERS THAT INCLUDE KIDS' POPULAR MELODIES. THIS IS FOR WOOD QUINTET. ARRANGEMENTS ARE ALSO AVAILABLE FOR FLUTE QUINTET, AND THE TANGO ''POR UNA CABEZA'' FOR DIFERENT QUARTETS: STRING QUARTET, WOOD QUARTET, METAL QUARTET AND SAXOPHONE QUARTET (SENT TO HOLAND) AND FOR WOOD QUINTET, AND "SOLEDAD", TANGO ARRANGEMENT (1998). THREE CHORALS FOR BRASS TRIO: WAS COMPOSED FOR THE "BOREALIS TRIO" FROM ALASKA (USA) WHO WILL HAVE SEVERAL CONCERTS WITH THAT WORK IN VATICANO, FIUGGI, AND OTHER PLACES IN ITALY, DECEMBER 2000, IN THE JUBILEO FESTIVAL (CAN BE FOUND AT WWW.DONNEINMUSICA.ORG). THIS WORK AND OTHERS OF THE SAME COMPOSER ARE PART OF THE REPERTORY OF THIS TRIO. THIS WORK IS PART OF THE CD "ROME HOLYDAYS-BOREALIS BRASS",EDITED IN EEUU. LITTLE TANGO PIECE: ONLY FOR PIANO. THIS VERSION PREMIERED IN CONNECTICUT, USA, IN MARCH, 2007.IT WAS PREMIERED IN BUENOS AIRES AND MENDOZA,ARGENTINA TOO. AFTER THIS, THE WORK IS PERFORMED AGAIN IN THE INTERNATIONAL FESTIVAL "MUSICA CLASICA POR LOS CAMINOS DEL VINO", IN MENDOZA ARGENTINA,2013, WHERE THE COMPOSER AND HER WORKS WERE HONNORED IN THAT EDITION OF THE FESTIVAL. TANGOIMPRESSIONS: THIS IS A WORK WITH TANGO INFLUENCES, FOR STRING QUARTET. IT HAS TWO PARTS: "AUDACIOUS TANGO" AND "ROMANTIC AND MILONGA." IT WAS PREMIERED IN 2003, AND THIS WORK IS INCLUDED IN A CD "TEAR" BY THE "DEL SOL STRING QUARTET"(RECORDED IN SAN FRANCISCO, UNITED STATES). THIS AND OTHER WORKS ARE PART OF THE REPERTORY OF THIS QUARTET, AS WELL AS OTHERS. THIS WORK HAS BEEN PERFORMED IN SEVERAL COUNTRIES, INCLUDING ITALY, AT THE BARI FESTIVAL, WHERE IT WAS SELECTED IN THE INTERNATIONAL SELECTION OF CHAMBER MUSIC OF WOMEN COMPOSERS, FOR THE INTERNATIONAL FESTIVAL IN BARI, ITALY. OUT OF 5 WORKS FROM AROUND THE WORLD, THIS STRING QUARTET WAS SELECTED. THE "FUNDACIÓN ADKINS CHITI: DONNE IN MUSICA" ORGANIZED THIS FESTIVAL (2007). THIS WORK, RECENTLY HAD SEVERAL PERFOMANCES WITH DEL SOL "STRING QUARTET" AND JANICE GARRET & DANCERS, IN COREOGRAPHIES. TANGOMINIATURES: (VERSION FOR PIANO-VIOLIN-HORN-OBOE-BASSOON).THIS WORK IS SELECTED IN INTERNACIONAL SELECTION FOR THE INTERNATIONAL HONOUR COMMITTEE, THE ASSOCIAZIONE CECILE CHAMINADE, FONDAZIONE ADKINS CHITI, AND "OROBIE" QUINTET TO BE PREMIERED AND PERFORMED IN THREE REGIONS OF TRENTINO, ITALIA IN AUGUST OF 2017. THE WORK WILL BE PART OF THE REPERTORY OF THE NEW DISC OF THE ENSEMBLE "CHAMINADE", IN 2018. ARGENTIA: VERSION FOR STRING QUARTET. ARGENTIA: VERSION FOR FLUTE AND PIANO. PREMIERED IN MEXICO FESTIVAL BY THE ARGENTINAN FLUTIST MARCELO ALVAREZ. TANGO IMAGES: FOR TUBA AND PIANO. THIS WORK WAS SPECIALLY COMPOSED FOR AN AMERICAN MUSICIAN, MARK NELSON, WHO COMMISSIONED THIS WORK, WHICH HE PREMIERED AT A CONCERT IN APRIL 2003. IT WAS ALSO PLAYED AT AN INTERNATIONAL CONFERENCE OF TUBA AND EUPHONIUM IN JUNE, AT ARIZONA UNIVERSITY. (WWW.ITEAONLINE.ORG) THIS WORK AND OTHERS ARE PART OF HIS REPERTORY, AND IT WAS PERFORMED IN OTHER U.S. STATES IN 2004, 2005 AND 2006 BY MR. NELSON AND OTHER TUBISTS. THIS WORK IS PART OF THE REPERTORIES OF SEVERAL TUBISTS IN VARIOUS PARTS OF THE WORLD. THIS WORK IS SELECTED TO BE THE MUSIC OF THE DOCUMENTAL VIDEO "LAS PALABRAS", PRODUCED BY "AUDIOVISUALES DEL SUR", IN ARGENTINA. TWO IMPRESSIONS: THIS WORK IS FOR XYLOPHONE AND VIBRAPHONE, AND WAS COMPOSED FOR THE NATIONAL UNIVERSITY OF CUYO PERCUSSION CATHEDRA. IT HAS TWO MUSICAL IMPRESSIONS AS DESCRIBED BY THEIR TITTLES: "DREAMS" AND "CLOCKS". THIS WORK WAS PUBLISHED IN "PERCUSSIVE NOTE" MAGAZINE, FOR PERCUSSIONISTS IN THE USA, BY THE PERCUSSION ARTS SOCIETY. IT WAS ALSO SENT TO FRANCE. THREE ARGENTINIAN PIECES: FOR CELLO AND VIOLIN. THIS WORK WAS COMMISSIONED BY A DUO OF VIOLIN AND CELLO FROM THE USA. IT WAS PREMIERED IN NOVEMBER 2003, IN USA. THIS WORK AND OTHERS ARE PART OF THEIR REPERTORY. IN ARGENTINA, THIS WORK WAS PREMIERED ON APRIL 6, 2007, IN THE INTERNATIONAL FESTIVAL OF CHAMBER MUSIC "POR LOS CAMINOS DEL VINO" IN MENDOZA. AND IN 2008 IN A DIFERENTS CONCERTS IN BUENOS AIRES. IN 2009 IT IS PERFOMED IN MENDOZA AGAIN. ANGELS´CARILLONS: FOR TUBA AND MARIMBA.THIS WORK WAS COMMISSIONED BY MARK NELSON, A TUBA SOLOIST WHO HAD PREMIERED SEVERAL PIECES BY THIS COMPOSER, IN THE USA. THIS WORK AND OTHERS OF THE SAME COMPOSER ARE PART OF HIS REPERTORY. THIS WORK WAS PREMIERED IN APRIL 2005.THIS WORK IS PART OF THE REPERTORIES OF SEVERAL TUBISTS IN THE WORLD. ALUCITANGO: FOR FLUTE-2 VIOLINS-VIOLA AND CELLO. THIS WORK HAS BEEN PREMIERED BY NOVA ENSSEMBLE, IN THE UNIVERSITY OF TEXAS CONCERT, IN NOVEMBER OF 2009, IN EEUU, SELECTED BY A CONTEST FOR ITS PREMIER. IT IS A VERY CONTEMPORARY TANGO FOR STRING QUARTET AND FLUTE. 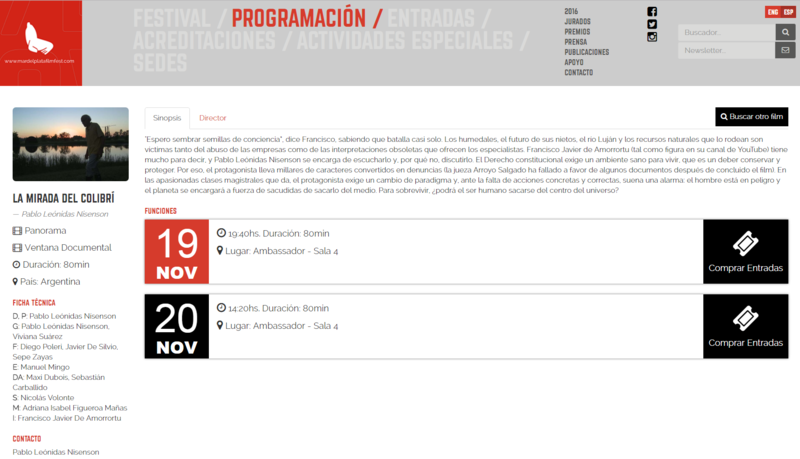 THE WORK IS PART OF FORO ARGENTINO DE COMPOSITORAS DISC. EL ARBOL: A WORK FOR TWO VOICES (SOPRANO AND MEZZO) AND PERCUSSION ENSEMBLE. THIS WORK WAS SPECIALLY PREMIERED BY MUSICIANS IN THE UNITED KINGDOM. RHAPSODIA ANDINA: THIS WORK, FOR HARPSCHORD AND OBO D´AMORE, WAS COMMISSIONED BY TWO MUSICIANS IN THE USA, AND IT IS PREMIERED IN 2007. RHAPSODIA ANDINA: IN FLUTE-PIANO (OR HARPSICHORD) VERSION. RHAPSODIA ANDINA: IN VIOLIN-PIANO (OR HARPSICHORD) VERSION. TANGORMACIÓN: FOR WIND QUINTET. PREMIERED I SPAIN. TWO ARGENTINIAN PICTURES FOR BRASS OCTET VERSION. THIS WORK IS ASKED IN JIULLIARD UNIVERSITY FOR JUILLIARD WOMEN'S BRASS PROJECT. TANGOLUCIÓN, FOR VIOLIN SOLO. PREMIERED IN BUENOS AIRES ,ARGENTINA IN NOVEMBER 2009, IN THE FADEC CONCERTS. MOTHERS LONELINESS : TWO PIECES SPECIALLY COMPOSED FOR COMMEMORATING 200 YEARS OF THE SCHIEDMAYER FIRM IN STUTTGART, SCHIEDMAYER CELESTA GMBH IN THE 3RD INTERNATIONAL CONTEST FOR COMPOSITIONS .THE WORK WAS NOT SELECTED, BUT IT WAS SELECTED FOR THE INTERNATIONAL CONGRESS OF IAWM TO BE PROGRAMMED IN 2015, IN EEUU. CUÉNTAME UNA HISTORIA BANDONEÓN: FOR TWO VIOLINS. HONNORED MENTION IN "THE INTERNATIONAL MUSIC PRIZES FOR EXCELLENCE IN COMPOSITION 2009' FOR "THE NATIONAL ACADEMY OF MUSIC, IN CONJUNCTION WITH THE MUNICIPAL CONSERVATORIES OF NEAPOLIS AND SYKIES, IN GRECIA. HONNORED MENTION IN "THE INTERNATIONAL MUSIC PRIZES FOR EXCELLENCE IN COMPOSITION 2009' FOR "THE NATIONAL ACADEMY OF MUSIC, IN CONJUNCTION WITH THE MUNICIPAL CONSERVATORIES OF NEAPOLIS AND SYKIES, IN GRECIA. EL LIBRO DE LOS ENCANTAMIENTOS, FOR FLAUTA, MARIMBA AND CELLO . FIRST PRIZE IN THE COMPOSITION CONTEST OF "FUNDACIÒN CULTURAL PATAGONIA, ARGENTINA,IN 2010, FOR CHAMBER MUSIC WITH PERCUSSION. THIS WORK WAS PREMIERED IN JULY OF 2011, IN A INTERNATIONAL FESTIVAL IN PATAGONIA ARGENTINA. AFTER THIS, THE WORK IS PERFORMED AGAIN IN THE CONCERTS OF FADEC, IN BUENOS AIRES,2013. IN 1014, THE WORK IS PRFORMED AGAI N THE UNIVERSITY OF CALIFORNIA LONG BEACH, EEUU, FOR "NEW MUSIC ENSEMBLE. "LOS SUEÑOS DE ALFONSINA" FOR PIANO. PREMIERED IN JUNE OF 2011 IN BUENOS AIRES, ARGENTINA. AFTER THIS, THE WORK IS PERFORMED AGAIN IN THE INTERNATIONAL FESTIVAL "MUSICA CLASICA POR LOS CAMINOS DEL VINO", IN MENDOZA ARGENTINA,2013, WHERE THE COMPOSER AND HER WORKS WERE HONNORED IN THAT EDITION OF THE FESTIVAL. "DOS ESTAMPAS" FOR SOLO EUPHONIO. "CUATRO MINIATURAS MÀGICAS", FOR PERCUSION ENSEMBLE. HONNORED MENTION IN CARL VON OSSIETZKY – COMPOSITION AWARD 11TH INTERNATIONAL CONTEST , GERMANY. "LA BANDA DE LA PLAZA", FOR BRASS ENSEMBLE, FOR BRASS OCTET & FOR TROMBON OCTET. "DIARIO DE VIAJE", FOR ENSSEMBLE OF 13 INSTRUMENTS. "LUCES DE TANGO" FOR TRUMPET AND STRING QUARTET. THIS WORK IS SELECTED FOR "TRAME SONORE" ENSEMBLE, AND FONDAZIONE ADKINS CHITI, TO BE PREMIERED AND PROGRAMED IN ITALIA (CAGLIARI), IN 2019. "TRANSPARENCIAS", FOR VIOLA, HARP, FLUTE AND VOICE. THIS WORK HAS A HONNORED MENTION IN THE "EULALIO FERRER COMPOSITION AWARD INTERNATIONAL CONTEST", IN 2012.THE PREMIER IS IN OCTOBER 22 , 2012. -"PUZZLE PARA PIANO": FOR PIANO. 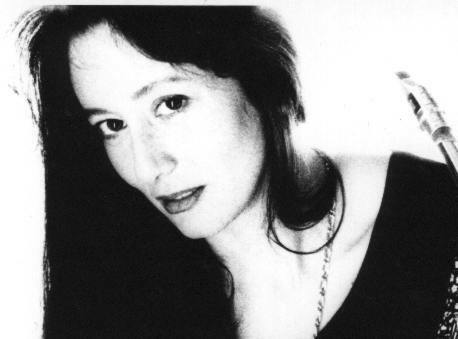 THE WORK IS PREMIERED IN THE INTERNATIONAL FESTIVAL "MUSICA CLASICA POR LOS CAMINOS DEL VINO", IN MENDOZA ARGENTINA,2013, WHERE THE COMPOSER AND HER WORKS WERE HONNORED IN THAT EDITION OF THE FESTIVAL. IN 1014, THE WORK IS SUBJET OF STUDY IN THE SECOND CONGRESS OF PIANISTS 2015, EN BUENOS AIRES, ARGENTINA. THIS WORK IS TAKEN AS LEIT-MOTIV OF THE ARGENTINEAN FILM "LA MIRADA DEL COLIBRI", WHERE THE COMPOSER CREATED THE ORIGINAL MUSIC. 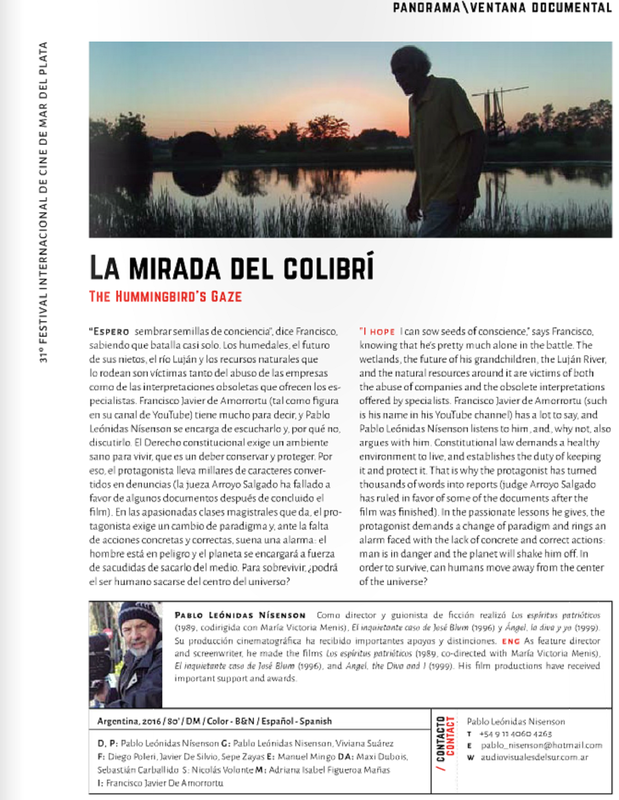 THE FILM IS PREMIERED IN THE INTERNATIONAL FILM FEST IN MAR DEL PLATA, ARGENTINA, 2016 EDITION. -3 PEQUEÑAS PIEZAS PARA 3, FOR MARIMBA, SOPRANO SAX OR CLARINET AND VIBRAPHONE & CAJÓN. PREMIERED BY THE COMPOSER AND VER PERCUSSION TRIO "WIND & MALLETS", IN THE INTERNATIONAL FESTIVAL "MUSICA CLASICA POR LOS CAMINOS DEL VINO", IN MENDOZA ARGENTINA,2013, WHERE THE COMPOSER AND HER WORKS WERE HONNORED IN THAT EDITION OF THE FESTIVAL. -SWEET CHILDHOOD: FOR TUBA, EUPHONIO AND PIANO, COMMISSIONED AND PREMIERED BY MARK NELSON, FROM USA. -"DANZA MÁGICA PARA CINCO FLAUTAS", SPECIALLY COMPOSED FOR THE ARGENTINEAN QUINTET OF FLUTES, "FLAUTAS DEL SUR". PREMIERED IN 2018. "LA MIRADA DEL COLIBRÍ", PIECES FOR TWO GUITARS, GOT OF THE MUSIC COMPOSED FOR THE FILM WITH THE SAME NAME. THE VERSION FOR PIANO-TROMBON IS PERFOMED AGAIN, IN OXFORD, LONDON, IN NOV.2009, IN THE 12TH LONDON NEW WIND FESTIVAL AND WOMAN IN MUSIC UK JOIN EVENTIN.IN 2013 IS PREMIERED IN ARGENTINA BY THE ORCHESTRA OF UNIVERSITY NATIONAL OF CUYO. FANTASY FOR TUBA AND ORCHESTRA (1999): (ALSO PIANO TUBA VERSION) THIS WORK IS FOR FIVE TUBA SOLISTS FROM ARGENTINA AND THE USA. THE PIANO-TUBA VERSION HAD ALREADY BEEN PLAYED IN THE USA. THIS WORK HAS ARGENTINIAN FOLK AND CLASSIC ELEMENTS. IT RECEIVED AN HONORABLE MENTION IN A NATIONAL COMPETTITION OF SYMPHONIC MUSIC FROM THE ARGENTINIAN ARTS FOUNDATION IN 1999. ITS SYMPHONIC PREMIER WAS IN SEPTEMBER 2002, IN THE THEATRE URF WITH THE NATIONAL SYMPHONIC ORCHESTRA OF BRASIL, WHERE THE TUBA SOLOIST FROM THAT ORCHESTRA, CARLOS VEGA, MADE A SPECIAL REQUEST OF THE COMPOSER TO CREATE THIS WORK. THE NATIONAL UNIVERSITY OF CUYO INCLUDES THIS WORK IN THE CHAIR OF TUBA CAREER, IN ITS SCHOOL OF MUSIC. THIS WORK WILL BE PUBLISHED IN THE ITEA JOURNAL, CONDUCTED BY MARK NELSON, TUBA SOLOIST, AND WILL BE AVAILABLE TO ALMOST ALL TUBISTS WHOM RECEIVE THIS JOURNAL WORLDWIDE. THIS WORK IS USED FOR CONTESTS OF THE FESTIVAL "TROMBONANZA", IN ARGENTINA, TO DO AN INTERNATIONAL SELLECTION OF TUBISTS, SO SEVERAL SOLOISTS, HAS PERFORMED THIS WORK. ARGENTIA (1999): THIS IS A SUITE FOR FLUTE AND ORCHESTRA (ALSO PIANO-FLUTE VERSION). THIS WORK HAS 4 NUMBERS, AND IT CONTINUES THE FOLK STYLE THAT THE COMPOSER GIVES TO HER SOLOIST WORKS. THE FLUTE AND PIANO VERSION OF THIS WORK WAS PREMIERED WITH THE COMPOSER AS THE SOLOIST. IT WAS PREMIERED BY THE CARSON CITY SYMPHONIC ORCHESTRA IN, NEVADA, USA 2004. THIS WORK WAS PREMIERED IN MENDOZA, ARGENTINA, BY THE ORQUESTA ACADÉMICA DE MENDOZA, IN 2018, TEATRO INDEPENDENCIA. THE CONCERT IS PERFOMED BY THE FOLLOWING ORCHESTRAS: "ARTURO TOSCANINI" & THE "ORQUESTA DEL TEATRO COMUNALE DI BOLOGNA", IN PIAZZA MAGGIORE, BOLOGNA, ITALIA, CONDUCTED BY VITO CLEMENTE. THE CELLO SOLOIST CELLO WAS MR. ROBERT COHEN, FROM ENGLAND. THAT CONCERT WAS BROADCAST SEVERAL TIMES FOR RAI TV IN ITALY AND RAI TV INTERNATIONAL. IN OCTOBER OF THE SAME YEAR, THIS WORK HAS OTHER PERFOMANCE IN ROVERETO, ITALY, WITH OTHER SOLOIST ANDREA NOFERINI. ROMANZA AND TANGO (2000): FOR VIOLIN AND ORCHESTRA (ALSO PIANO-VIOLIN AND FLUTE-PIANO,VERSION). THIS WORK IS IN THE CHAIR OF VIOLIN AND CHAMBER MUSIC OF THE NATIONAL UNIVERSITY OF CUYO. THIS WORK WAS PREMIERED FIRST IN BRASIL, AND AFTER IN ARGENTINA IN 2012 BY THE PHILARMONIC ORCHESTRA OF MENDOZA , AND THE SOLOIST MARIELA NEDYALKOVA , IN THE OPENNING OF THE CONCERT OF THE INTERNATIONAL FESTIVAL"POR LOS CAMINOS DEL VINO 2012 EDITION"
TANGO PICTURES: THEY ARE 3 TANGUISTIC NUMBERS FOR MEDIUM ORCHESTRA: "LOVERS", "LOVE AND PASSION", AND "THE DANCERS". THESE NUMBERS DESCRIBE TANGUISTIC SCENES, AS THOUGH THEY ARE PAINTED IN A PICTURE. THIS WORK WAS PREMIERED BY THE CARSON CITY SYMPHONY IN THE USA, CONDUCTED BY DAVID BUGLI IN 2003. THIS WORK WAS PREMIERED IN MENDOZA, ARGENTINA, BY THE ORQUESTA ACADÉMICA DE MENDOZA, IN 2018, TEATRO INDEPENDENCIA. THE WORK WAS COMPOSED IN 2004 AND THE WORLD PREMIER WAS IN OCTOBER 2008, AT THE "UNIVERSIDAD" THEATRE, IN MENDOZA, ARGENTINA AND PERFORMED BY THE SYMPHONIC ORCHESTRA OF THE NATIONAL UNIVERSITY OF CUYO, WITH THE WOMEN CONDUCTOR LUCÍA ZICOS, FROM BUENOS AIRES. IN 2009, THE WORK HAS DESERVED A MENTION OR DISTINCTION FROM SADAIC (COMPOSERS SOCIETY OF ARGENTINA), OWING TO THE WORLD PREMIER IN THIS COUNTRY. "FORMA HUMANA": A SYMPHONIC FANTASY FOR FULL ORCHESTRA OF A PROFESSIONAL LEVEL. THIS WORK HAS NOT YET BEEN PREMIERED.THERE ARE THE VERSION FOR ORCHESTRA AND CHOIR OF THIS WORK TOO. "RHAPSODIA CIUDADANA": FOR SYMPHONIC BAND. THIS WORK IS SELECTED AS FINALIST IN "FRANK TICHELI COMPOSITION CONTEST" COMPOSITION COMPETITION FOR BANDS OF MANHATTAN BEACH MUSIC. (2009), BETWEEN 150 SCORES. PREMIERED IN SPAIN, BY THE BAND OF VALENCIA. PREMIERED IN ARGENTINA IN 2017, BY THE BANDA DEL TEATRO LIBERTADOR DE CÓRDOBA. "LATINOAMÉRICA": FANTASY FOR PIANO AND ORCHESTRA. THIS WORK WILL BE PREMIERED IN ARGENTINTNA IN 2011, WITH THE FILARMONICA OF MENDOZA AND THE SOLOIST DORA DE MARINIS, IN THE OPENNING OF THE CONCERT OF THE INTERNATIONAL FESTIVAL"POR LOS CAMINOS DEL VINO 2011 EDITION"
"PAISAJES DE BRONCE": FOR ORCHESTRA AND TUBA & TROMBON AS SOLOISTS. NO- PREMIERED YET. VIENTOS DE LIBERTAD, FOR SYMPNONIC BAND. PREMIERED BY THE SYMPHONIC BAND OF THE MONCADA, CONDUCTOR: JOSE ALCACER DURAVALENCIA ESPAÑA, IN MARCH 4TH, 2011. CONDUCTOR : JOSE ALCACER DURA. IN 2018 THIS WORK IS PREMIERED IN EEUU BY THE SANTA CRUZ CITY BAND, JOHN THOMAS , CONDUCTOR. "NOCHE Y BANDONEÒN": FOR BANDONEÒN AND STRINGS ORCHESTRA.THIS WORK WAS COMPOSED SPECIALLY FOR THE ARGENTINIAN SOLOIST DANIEL BINELLI, AND IS PREMIERED IN SEPTEMBER 24 TH, 2010, IN MENDOZA ARGENTINA BY BINELLI AND THE "ORQUESTA FILARMÒNICA DE MENDOZA", UNDER THE CONDUCTION OF LIGIA AMADIO (BRASIL), IN THE "TEATRO INDEPENDENCIA", MENDOZA, ARGENTINA. "HAY VIDA EN SU CORAZÒN" FOR SOPRANO VOICE SOLOIST & ORCHESTRA. NO PREMIERED. "DIARIO DE VIAJE", FOR SMALL ORCHESTRA, FIRST PRIZE IN SYMPHONIC CATHEGORY IN THE FIRST COMPOSITION CONTES FOR PEACE, ARGENTINA, 2014. "LOS ANDES", FOR SAXO SOPRANO SOLISTA & SIMPHONIC BAND", PREMIERED IN MARCH 6 ,2012, IN EEUU, AND PERFORMED WITH DIFERENT BANDS AFTER THE PREMIER WITH THE SOLOIST GEORGE WOLFE. PREMIERED IN ARGENTINA IN 2017, BY THE BANDA DEL TEATRO LIBERTADOR DE CÓRDOBA. CONDUCTOR: HADRIAN AVILA. SOLOIST: GUILLERMO REBOSOLAN. "TRES PIEZAS MODERNAS PARA FAGOT Y ORQUESTA", PREMIERED THE MARCH 1ST, O2012, BY THE ORQUESTA DE LA UNIVERSIDAD NACIONAL DE CUYO, EN MENDOZA, ARGENTINA. SOLOIST: ANDREA YURCIC. CONDUCTOR: JORGE LHEZ. THIRD AWARD ON COMPOSITION IN TRIBUNA DE LA MÚSICA ARGENTINA AWARD "CATEGORÍA MÚSICA CONTEMPORÁNEA, CATEGORÍA GENERAL"
"LEYENDAS DE AMÉRICA" FOR SYMPHONIC ORCHESTRA & A GROUP OF PERCUSION. "LA HISTORIA DE LA TIERRA", A POEM FOR SYMPHONIC BAND. PREMIERED IN SPAIN BY BANDA MUNICIPAL OF GRANADA, SILVIA O. ANARTE, CONDUCTOR. "TANGOIMAGES FOR TUBA & STRING ORCHESTRA VERSION", ARRANGEMENT BY JOSE MARIA LOPEZ KIEFFER, UNDER THE SUPERVISION OF THE COMPOSER. WORLD PREMIER OF THIS VERSION, IN MARCH AND APRIL OF 2018, PIMA COMMUNITY COLLEGE, TUCSON EEUU, SOLOIST: MARK NELSON, CAYCE MINER, CONDUCTOR FIRST, AND ARIZONA SYMPHONY ORCHESTRA, LINUS LERNER, CONDUCTOR, IN TWO CONCERTS MORE. THIS WORK IS RECORDED IN TUBA AND STRING QUINTET VERSION AND INCLUDED IN THE DISC OF THE ARGENTINEAN TUBIST ABEL MANZOTTI. 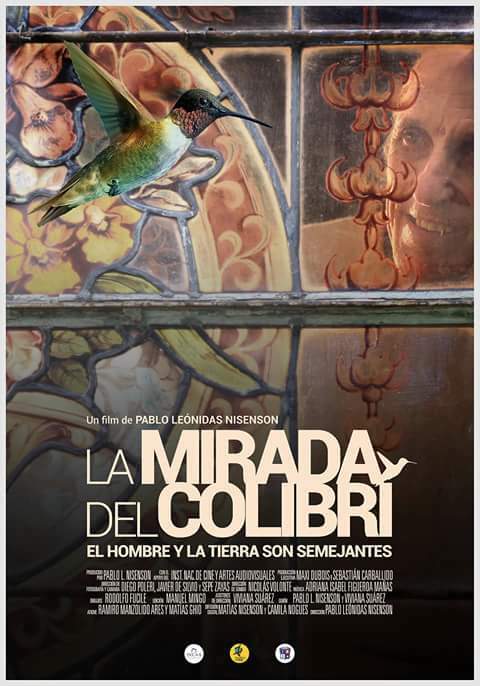 - Original Music for the documental film "La Mirada del Colibrí", of the director Pablo Nisenson and support of INCA Cine Argentino. The film is selected to be performed in the International Film Festival de Mar del Plata ,2016. -FOR "ROBOTRONICA"FROMN COLOMBIA, THE MAIN THEME OF THE TV PROGRAM "EL CLUB DE TV SWITCH"
-FOR COMICS PRODUCTIONS OF MEXICO, ORIGINAL COMPOSITION AND SCORING OF MUSIC. -SUITE N.1 FOR VIDEOGAMES: 10 FILM MUSIC THEMES. - SUITE N.2 FOR VIDEOGAMES: 8 FILM MUSIC THEMES. -MUSIC FOR TRAILER OF THE VIDEOGAME "THE SECRET OF IVAN", FROM MEXICO. THIS VIDEOGAME HAS BEEN APROVED BY FONSOFT(ARGENTINA) AS TECHNOLOGIC PROJECT TO BE DEVELOPED AND FINISHED IN 2017.